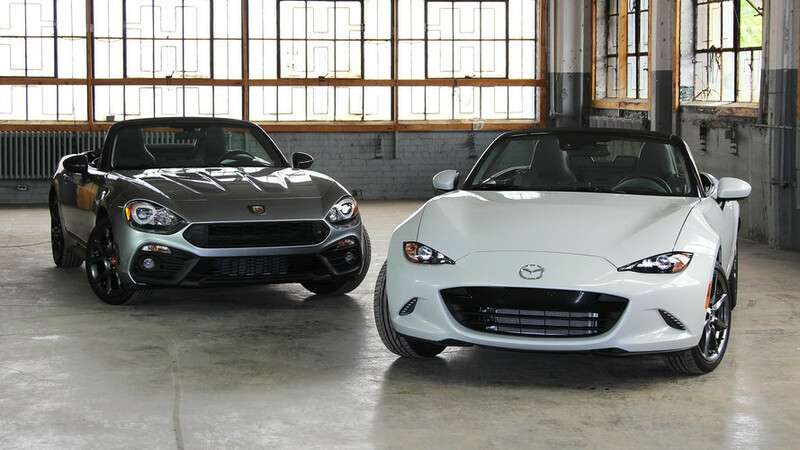 From the moment it debuted, I’ve called the Fiat 124 Spider, “Fiata.” There’s no hiding the fact that this Italian roadster shares its bones with Mazda’s iconic MX-5 Miata – the cars even come out of the same factory in Japan. That’s not a bad thing, of course. 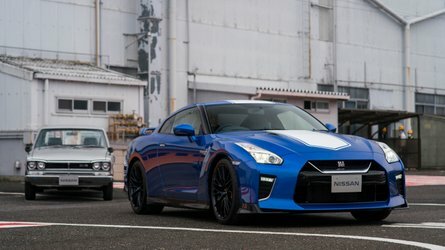 If you have a choice of donors for a sports car, why not go with one of the best? But this isn’t just a copy-and-paste, badge-engineered creation. 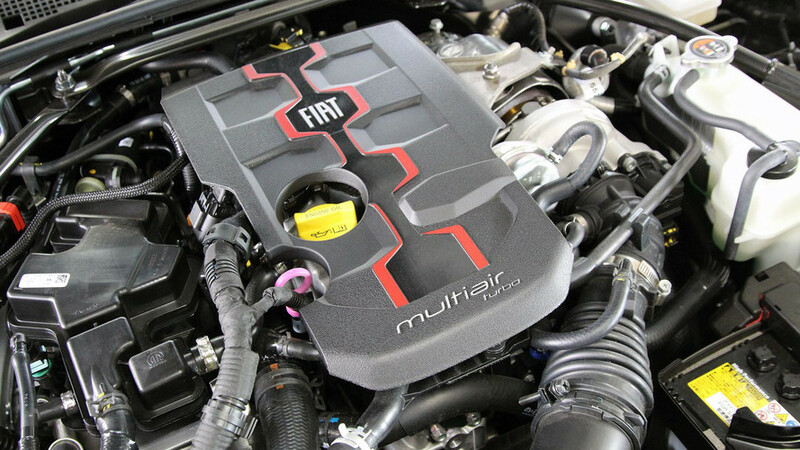 The Fiat makes more power, with a turbocharged engine underhood, and has unique suspension tuning. Fiat’s version is also a bit longer – not to mention a bit heavier – and has a style all its own. 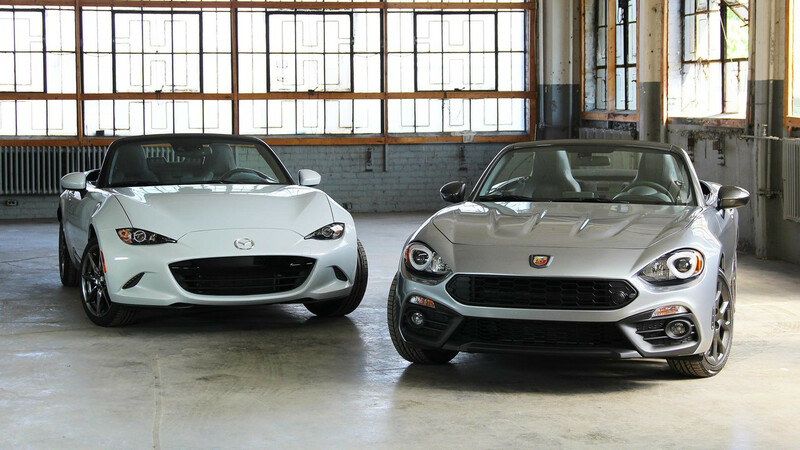 Does the Italian spinoff usurp the intrinsic greatness that is the Miata? I got both cars together for a back-to-back drive to find out. Fiat: The turbo engine is a great fit for this car. The added low-end shove is noticeable – pulling away from a stoplight, I’m almost certainly quicker in the 124 than in the Miata. The six-speed automatic transmission is smooth and well behaved, though I’d obviously prefer a manual here (available, just not equipped to this specific test car). Also, kudos to Fiat for giving this Abarth model an appropriately raspy exhaust. It reminds me that the Miata could benefit from a bit more aural delight. 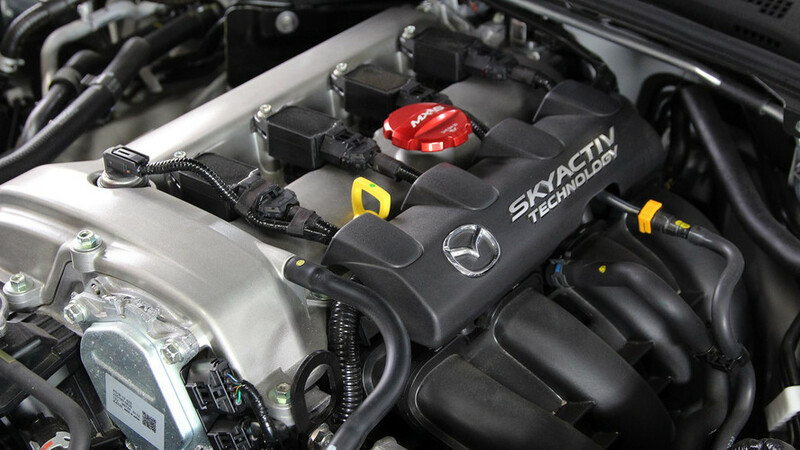 Mazda: God bless the naturally aspirated engine and its linear power delivery. While the Fiat is a champ off the line, I like the Mazda’s 2.0-liter because it’s so revvy and playful. The six-speed manual is a joy to use. And despite being down 11 horsepower and 36 pound-feet, I wouldn’t call the Miata “underpowered” compared to the Fiat. 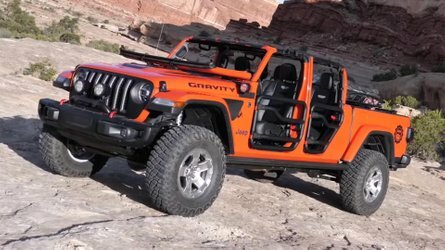 This car rewards my desire to drive with a lead foot. Fiat: This car feels more like a tiny grand tourer at times, with a comfortable ride on the highway, and a solid, planted feeling at speed. 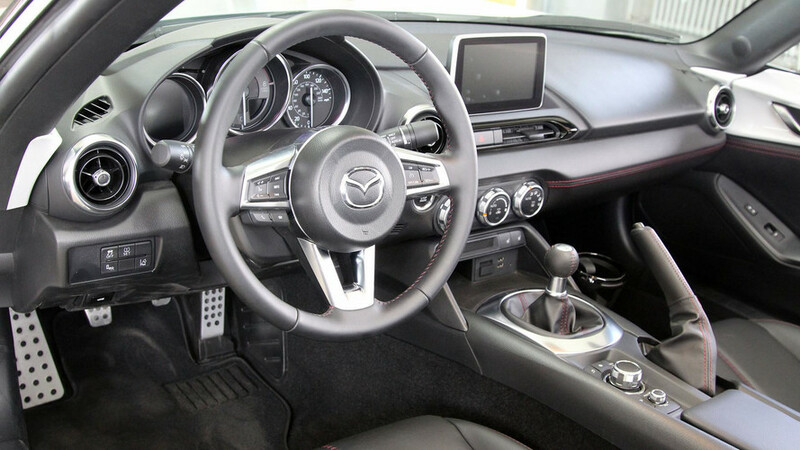 I like the weight of the steering – it’s certainly heavier than the Mazda’s – but actual feedback levels are about the same here as in the Miata. Mazda: This is definitely the more playful car of the pair. 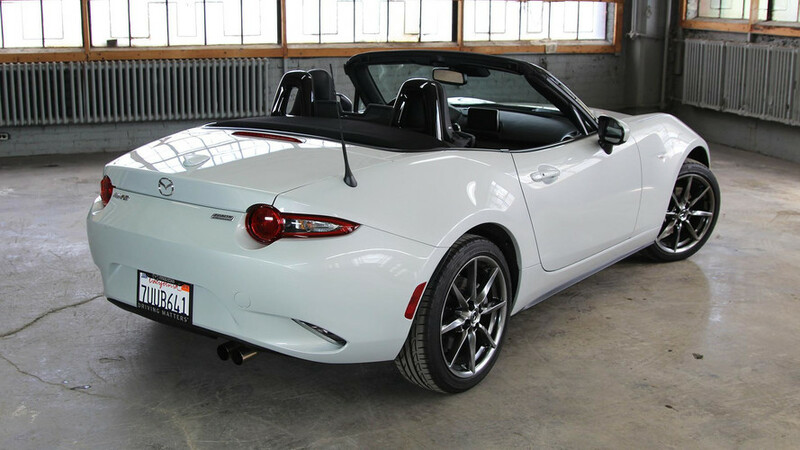 First, the Miata is some 200 pounds lighter than the 124. The steering is lighter in action, too. While I think the Fiat has a better ride quality at higher speeds, the Miata feels more eager, more tossable. It’s just more fun, even if it’s a little less plush on the highway. Fiat: I know, I know, beauty is in the eye of the beholder. But park these two cars next to each other, and I can’t see why anyone would pick the Fiat. 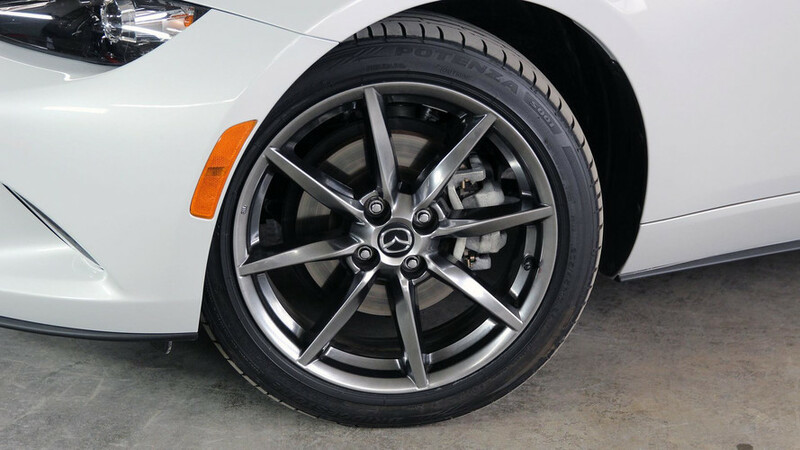 The dark-finish, 17-inch wheels look really nice, and the classic roadster shape is undisturbed here. 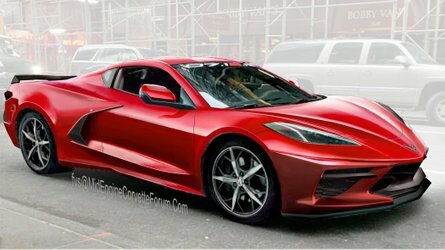 But the larger front and rear overhangs, not to mention those bulgy headlights, just don’t work for me. 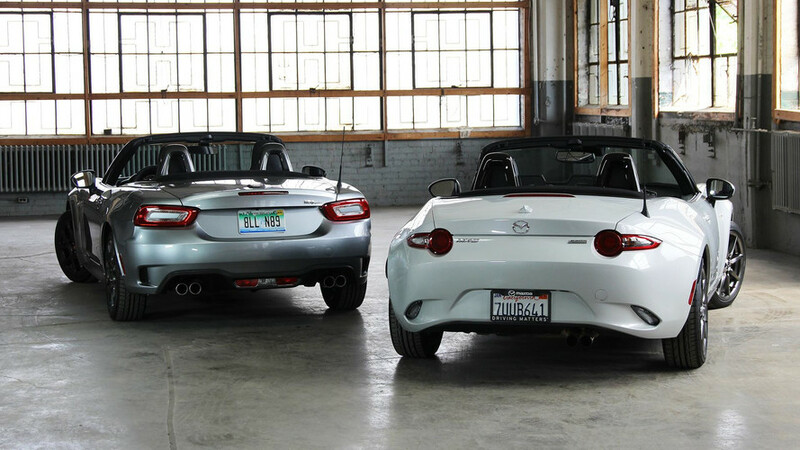 Mazda: It’s obvious that the Miata was designed first – this car is so svelte and taut. 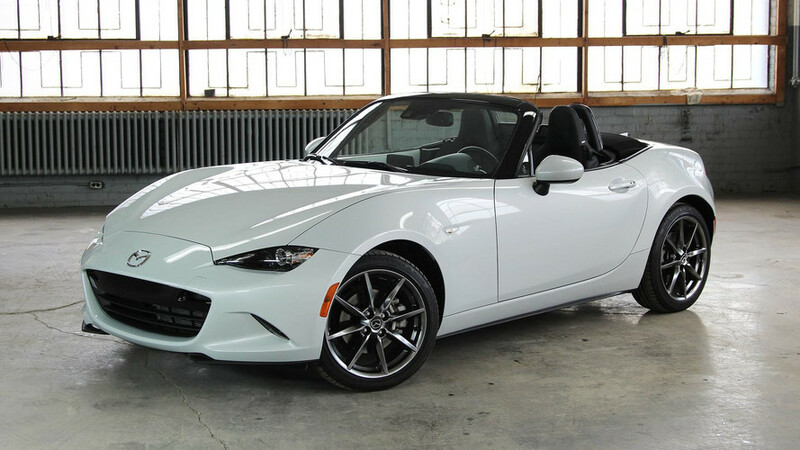 Even though they’re roughly the same size, the Mazda looks a lot smaller, and it’s free of unnecessary creases or curves that distract from the simplistic beauty of the small roadster shape. 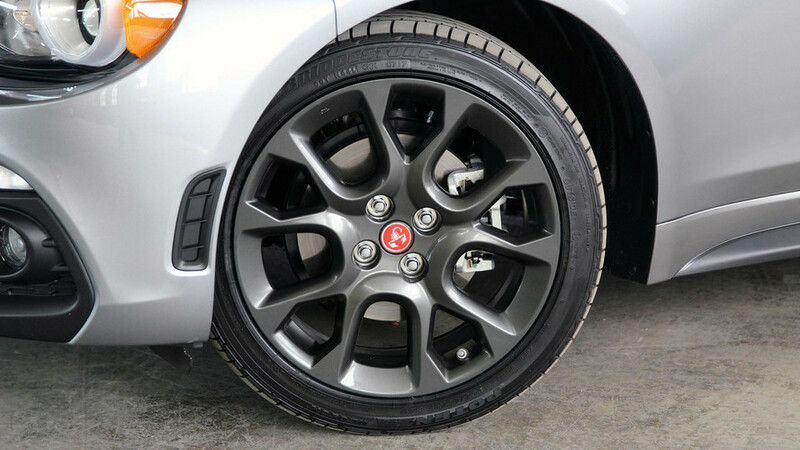 Fiat: The 124’s steering wheel has a thicker rim, and is wrapped in much nicer leather. Otherwise, the interiors of these two cars are largely the same, right down to the wiper and headlight stalks, buttons and knobs, and dials for the infotainment and climate controls. The Fiat’s added length makes it a bit more cargo-friendly, with nearly an additional half a cubic foot of storage. When we’re talking about trunks in the sub-five-cubic-feet range, every last inch helps. 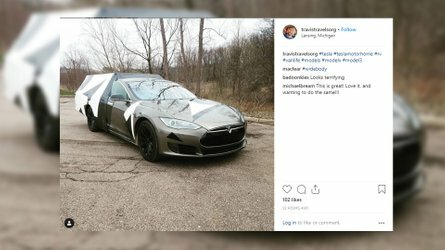 Mazda: Maybe it’s just these two specific test cars, but I have a much easier time folding the Miata’s roof than the 124’s. In the Mazda, it’s the same one-flip motion with a small pat to secure the roof behind the front seats. In the Fiat, it’s the same motion, but the top doesn’t want to stow as easily, for some reason. The Miata’s seats also have less-aggressive side bolsters, making it easier to turn around to operate the manual roof. In base form, the Fiat is only $90 more expensive than the Mazda. 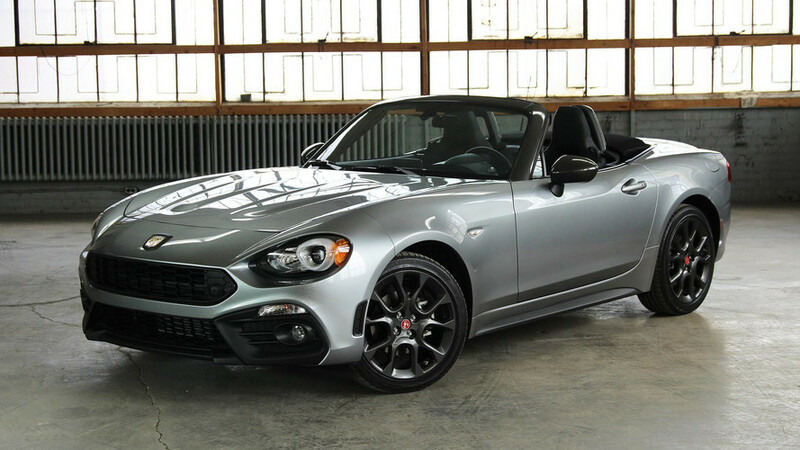 Loaded up in these Abarth and Grand Touring specs, the 124 costs $30,540 and the Miata is $31,325. That difference is almost negligible, and both cars come with the same level of equipment: leather, heated seats, navigation, automatic headlights, and automatic climate control, though the Fiat is the only one that offers a backup camera (for now). Though I really like the Fiat 124 package, I don’t think it’s any better than Mazda’s original formula. The Miata is slightly more energetic, even if it’s down on power, and I think it looks better. 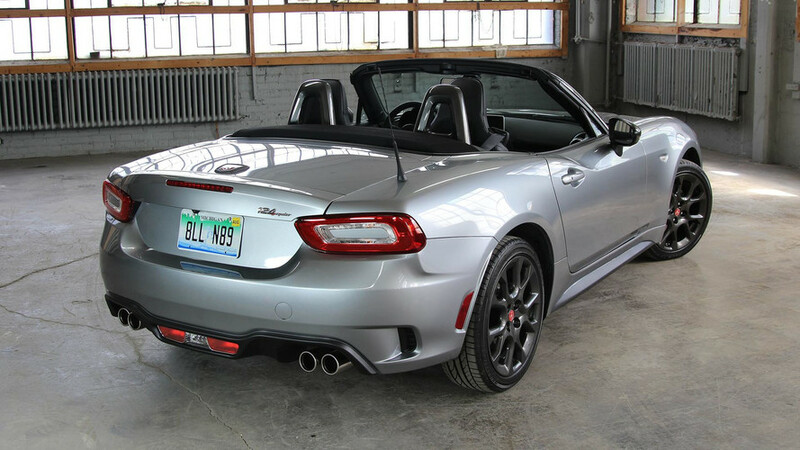 I won’t discourage anyone from buying the Fiat – I think there’s a lot to be said for its smoother, more refined dynamics and its larger trunk. 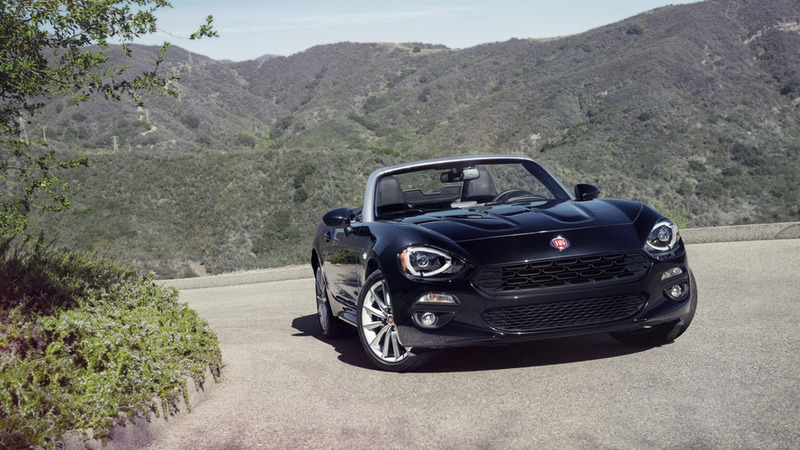 The Fiat is indeed charming, but the Miata continues to get the formula just right.